The only route that approaches Mt. Kilimanjaro from the north, Rongai route is truly one of the more remote and wild trails on the entire mountain. Despite that however, this route offers trekkers plenty of advantages, making it a very appealing option for those looking for a unique experience on Africa’s tallest peak. Due to its remote nature, the Rongai Route is amongst the least visited of all of the trails on Mount Kilimanjaro. Those who choose this path will experience peace and quiet for much of the trek, encountering few other climbers prior to reaching the Kibo Camp, at which point the trail merges with the Marangu Route for the final push to the summit. Before that happens however, travelers will often have the path completely to themselves for hours or even days at a time, making this a good choice for those looking for solitude in a unique wilderness setting. Rongai route approaches Mount Kilimanjaro with a slow, steady climb, giving hikers a chance to acclimatize at a steady rate. This not only makes it one of the easier routes up the mountain, it also increases the success rate substantially. There are few major obstacles to overcome along this trail and the final day before summit day is a short one, giving trekkers a chance to rest, recuperate, and prepare for their climb to the top of Uhuru Peak. Because the Rongai Route starts on the north side of the mountain, not far from the border with Kenya, it is also the driest route on Kilimanjaro as well. This makes it a good choice for a trek all year round, but especially during the rainy season in April and May. Most of the rain storms tend to stay on the southern side of the mountain, allowing Rongai hikers to stay drier and warmer than those on some of the other, more popular, trails. Other advantages of choosing the Rongai Route include the potential to spot wildlife, including colobus monkeys, in the first few days of the climb. The campsites are also nicely staggered out across the route, ensuring that hikers spend a similar amount of time on the trail each day. And since the trail goes up the north side and down the south side, travelers get a sense of what Kili looks like from different perspectives. If there is one criticism of the Rongai Route it is that it may not be as scenic as some of the other routes up Mt. Kilimanjaro. While it is true that the scenery isn’t as varied and dramatic as some of the other trails, there is still plenty to see and enjoy on this path too. And because you’ll encounter so few people, you’ll have an easier time soaking it all in. The itinerary below describes the 6 nights/7 day Kilimanjaro climb via the Rongai route. To shorten the below itinerary to six days you skip the night in the 3rd Cave and instead walk straight from the Mawenzi Turn Hut in one day. The adventure beings with the drive through villages and coffee plantations to the remarkable wooden village of Nale Moru. On the northeast side of the mountain where you meet the porters. The first part of the trail leads through moist rainforest, which quickly becomes lighter on the dry north side. Soon you will reach the heather zone. Overnight in the First Cave Camp (Simba Camp) in the tent at about 9,300 ft altitude. Simba Camp is located close to First Cave, with a magnificent view out over the plains of Kenya. Today’s stage begins in the morning with a steady climb up to Second Cave. The route takes in a long stretch of heath, distinguished by heather, wild flowers and stony paths. As you walk, you can enjoy the view of Kibo and the east-facing glaciers on the crater rim. After lunch you will leave the main trail and continue along a narrower path towards the jagged peaks of Mawenzi. You will finally reach ‘Second Cave’, which is located in a sheltered valley close to Kikelewa Caves and surrounded by giant senecio plants. This day has been set aside for acclimatization, to improve your chances of reaching the summit, and reduce the risk of your suffering the effects of altitude sickness. Spend the morning relaxing and simply enjoying the surroundings. Around lunchtime, it is time to leave the camp and make your way across the heath, following a narrow path towards the jagged peaks of Mawenzi and Third Cave. Today’s stage takes you to Mawenzi Tarn Hut. Following a short but steep climb up grassy mountainside, you can enjoy a fantastic panoramic view as your reward. The heathland gives way to rocky highlands, littered with large and small volcanic boulders that testify to a previous period of volcanic activity. After a couple more hours on the trail, you will reach the site of your overnight accommodation, which enjoys a spectacular location, nestling in a valley between the towering spires of Mawenzi. You will now find yourself walking through the almost lunar landscape that is known as ‘The Saddle’ and links Mawenzi and Kibo. On arrival at Kibo Huts, located at the foot of the Kibo crater wall, it is time to ready your equipment and warm clothes for the next day’s trek to the peak. Make sure to store your drinking water in a Thermos to prevent it freezing solid. Then spend the rest of the day relaxing and go to bed early to ensure your ‘human batteries’ are fully charged for Kilimanjaro’s ultimate challenge. You will be woken up around midnight, and there is just time for a light meal before you set off into the night. Most people find the tricky terrain, where the trail is littered with loose stones, to be the most challenging part of the ascent. The objective is to reach Gilman’s Point at dawn, so you can make it to Uhuru – the highest point on Kibo – shortly after sunrise. You will stop briefly at Gilman’s Point to enjoy the magnificent view before continuing along the rim of the crater to Uhuru. The last stretch of the climb features an even incline. Depending on the season, you may encounter snow on the last part of the route to Uhuru Peak, which is your final goal: the top of Kilimanjaro and the highest point in Africa. Once you reach the peak at an altitude of 5,895 masl, you can give yourself a pat on the back, enjoy the magnificent view and have your picture taken in front of the Uhuru Peak sign as a lasting souvenir of your achievement. It is then time to start the descent to Kibo Huts, which you will find passes remarkably quickly. At Kibo Huts, you will stop to enjoy a well-deserved lunch before continuing on to Horombo Huts, where a much-needed night’s sleep awaits. We make the final descent through the rain forest to Marangu Gate. Here we will have lunch and say goodbye to our mountain crew before leaving Mount Kilimanjaro National Park. Drive back to Arusha for a hot shower and a celebratory dinner. The questions and answers below are specific to the Rongai route. How difficult is the Rongai Route? The Rongai route is considered to be one of the easier routes up Mount Kilimanjaro. The trek is both gradual and steady. However, the Rongai Route does not have a great climb high sleep low profile which makes it arguably more difficult than the Machame or Lemosho routes. The 7 day trek option is highly recommended as it allows for better acclimatization. No technical climbing is required however level of fitness is required. What is the distance of the Rongai Route and how many days does it take? The exact trekking distance for the Rongai Route is 79km or 49 miles. The shortest number of days required for Rongai Route is 6 days, but by the time you have added on arrival and departure days it is 9 or 10. However, as it’s considered the easiest route on the mountain it is actually best done over 7 days to increase your changes of success. 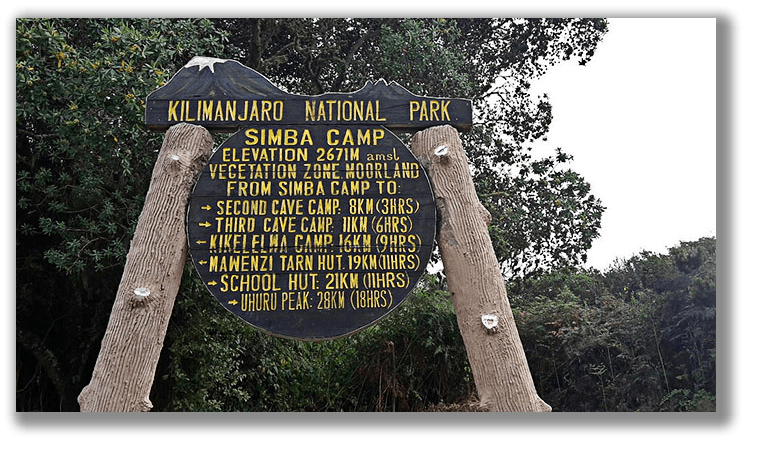 What is the Rongai Route Route Summit Success Rate? rate for the 6 day trek. However, We have a 95% summit success rate for both Rongai route treks. What is the Scenery like on the Rongai Route Route? The Rongai Route is the only route that approaches Mount Kilimanjaro from the north, near the Kenyan border. The Rongai route has low crowds and passes through remote wilderness areas. It is probably the only route where seeing wildlife in the first days is possible. After passing throughrainforest you ascend through moorlands and then up into the high alpine zones before reaching the glacial zone. When is the best time to Trek Rongai Route Route Route? July-September is the best time to trek the Rongai route, as the weather is most stable during this period and encountering rain is less likely. That said, since it is close to the equator it is possible to climb the mountain at any time of the year. April and May is the rainy season so this period is best avoided. 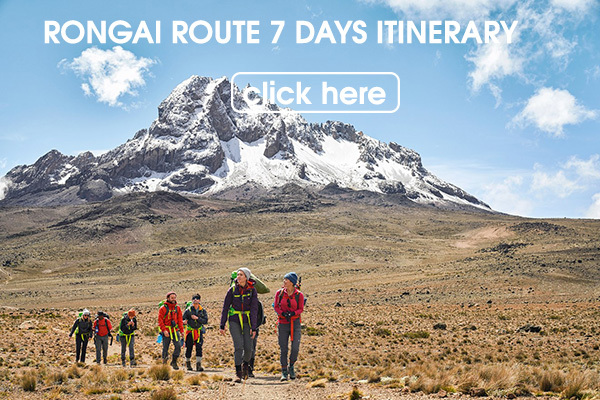 Because Rongai Route is on the northern side of Kilimanjaro is in a rain shadow, the month of May and November are a good time to do the trek.